Malik ‘Poot’ Carr: It’s a cold world, Bodie. Preston ‘Bodie’ Broadus: Thought you said it was getting warmer, man. Malik ‘Poot’ Carr: World going one way, people another. I’ve been watching The Wire again of late. I thought of this exchange when I found out that in spite of the Xarelto lawsuits being filed and the massive number of television commercials you are seeing from personal injury lawyers talking about the risks of Xarelto, Johnson & Johnson and Bayer intend to move forward with plans to push the FDA drug for additional uses. This comes in spite of all of these excessive bleeding lawsuits and the fact that the FDA has already shot down these attempts on three separate occasions. The litigation (and justice?) world is going one way, the business people at these drug companies are going another. The game plan to conduct three studies to investigate the efficacy and safety of Xarelto in people who have had an embolic stroke of undetermined source, people with peripheral artery disease undergoing peripheral artery interventions, and individuals who have had an acute coronary syndrome. Note: There is an important January, 2015 update below. Why would they do this? I think these companies are making a number of calculations. First, they probably believe that plaintiffs’ counsel has these cases all wrong and, even if juries do buy plaintiffs’ arguments, they will be able to settle these cases and just strengthen the bleeding warnings. Even more hopefully, for everyone, would be that a bleeding reversal agent can be found which will really give these companies the cover to settle the Xarleto cases while still defending their product moving forward. You also have to keep in mind the big picture: this is a nearly $1 billion a year drug and if they can expand the on-label uses of the product, that billion number will be the rear view mirror pretty quickly. Litigation costs and the cost of paying settlements and verdicts can sometime pale in comparison to the money that these companies can make from these drugs. So as long as there is hope that they can get clear of the problem one day, litigation can be just one hassle like any other. This is a $10 billion a year market that is just getting bigger as we age. Some analysts have suggested sales for Xarelto alone could reach $9.5 billion by 2020. How many class action settlements have gone over $9.5 billion in this history of mass tort cases? If you are cynical, like I have grown to be on this stuff after once representing companies like this, you will note that these drug companies can do the math. Bayer knows math, let me tell you. It is selling its chemical business, which was the foundation of the company, to focus on trying to make more money on lucrative products like Xarelto. By 2013, Xarelto had accumulated more than $2 billion in sales. This company is following the money in more ways than one. In all of the articles I’ve seen talking about this spinoff, they point out that Bayer is making money hand over fist on new pharmaceutical drugs. What is the first one that gets mentioned every time. You bet. Xarelto. 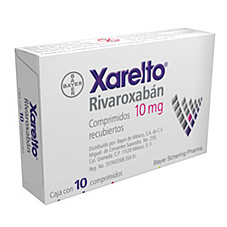 Xarelto has the chemical name of rivaroxaban. First approved by the FDA in 2011, it is a prescription blood thinning medication that can decrease the risk of stroke and blood clots in people with atrial fibrillation, an abnormal heart rhythm that results in loss of active squeezing of the upper heart chambers. Doctors also prescribe this drug to prevent deep vein thrombosis pulmonary embolisms. It is used on and off label for other things as well that fall along these same lines — stopping clots. Everything was going peachy with the drug at first glance. The drug was stealing market share from warfarin because that drug is a brutal drug to have to take for patients. You need frequent blood tests to regulate the dose. It interacts badly with other drugs and some foods. People sometimes get frustrated with it to the point where they just quit the drug, putting themselves at sometimes grave risk. So Pradaxa and Xarelto came on the market to much acclaim. Sure, at $3,000 a year Xarelto costs 15 times what warfarin. But that is not the real cost to the patient, right? The patient just wants to be able to live as normal of a life as possible, a place that is hard to find on warfarin. But the problem with Xarelto is uncontrollable bleeding. In January 2014, the FDA mandated that Xarelto include a warning of the increased risk of bleeding or blood loss. But isn’t that a problem with all of these anti-coagulants on some level? Are we blaming the product for doing what we know it is going to do, thin the blood? It sounds that way and certainly the Xarelto people would like you to think the plaintiffs’ attorneys are just filing lawsuits because people are getting unavoidably hurt. The older blood thinners like warfarin have antidotes in emergencies. There is no antidote yet for Xarelto. Are These Cases a Class Action Lawsuit? These cases are not a class action lawsuit. Individual cases are being filed around the county. It is expected that sometime soon, plaintiffs’ attorneys will petition the court to make these cases an MDL class action. This means that for discovery purposes, the cases would all be consolidated together under one federal court judge. Why not just make the request now? Plaintiffs need more filed cases because one of the requirements of the MDL is a large number of cases that would justify consolidation. The best guess here is that these cases will be consolidated in an MDL by next spring. But that is just a guess. 2015 Update: There now is a class action MDL lawsuit. Bayer had been pushing for these cases to wind up in New Jersey under a federal court judge there familiar with these issues. But U.S. District Judge Eldon Fallon in New Orleans, Louisiana was assigned the cases. This means that every federal court lawsuit filed will be send to Louisiana for discovery. So it is a class action lawsuit for discovery — so the plaintiffs can learn all about what these companies are going to contend and what their experts and employees will say. Will your class action claim involving Xarelto ever come back to your home state? Yes, the cases will eventually go back to their local states if a global settlement cannot be reached. How Much Will Xarelto Settlements Be Worth? How much money will settlements Xarelto claims bring? No one knows. These claims are being viewed like the Pradaxa cases that Boehringer Ingelheim has agreed to pay $650 million to resolve the vast majority of the cases. These cases have the potential to be even larger but that remains to be seen. Plaintiff’s lawsuits in these cases allege that these drug companies have willfully, wantonly and with malice withheld their superior knowledge of increased risk of irreversible bleeds in users of this drug. Why? They did this because they wanted to get their drug on the market and keep in on the market. Xarelto Problems: Lawsuits on the way? Get more information on these claims.